Mount Gabriel Christmas Trees is the brand name adopted by our main tree growing farm at Drury. Established as a choose and cut operation with the intention of supplying our other outlet at Mangere Bridge with quality cut trees to supplement their existing on site grown stocks. We are situated in the semi rural country suburb of Drury lying 26 km south of Auckland’s International Airport. Set on lush flat country side the farm covers an area of approximately 9 hectares. 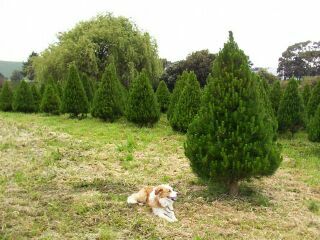 We originally established our Christmas tree farm to produce a consistent and reliable supply of large trimmed and sheared Christmas trees for our outlet at Onehunga. However, as inquiries were fielded from customers we realized there was not only a demand for medium to large trees but also for good quality well shaped small trees, even small enough for a flower vase. Retail demand for our trees has increased to a point where we no longer offer a wholesale service to other Christmas tree businesses. The only place you can buy a Mount Gabriel Christmas tree is direct from one of our three farms in Mangere bridge or Drury. That way we can keep control of not only the quality of the trees but also the quality of the service. In conjunction with the tree farm we have also established a nursery to grow our own low GF rated Radiata pine seedlings as these were almost impossible to procure from existing forestry orientated tree nurseries. All the desirable traits that are striven for in a timber tree, large stem, fast growing and minimal branching are quite undesirable characteristics for a Christmas tree. 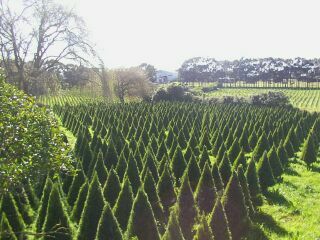 The nursery is now working with other species of trees including fir, spruce and cypress, which up until now have been unavailable as Christmas trees in the Auckland region. The main aim of this site is to show the process and work involved in the production of a quality Christmas tree and to teach the tree buyer what to look for in a tree and how to look after their tree in the hope that the work that has gone into producing the end product will be valued and appreciated. We hope that you find your visit to our site interesting and educational and if you have any questions you would like us to answer or would like to make a suggestion please send us an email.